The Armstrong Standard Excelon Imperial Texture Desert Beige Vinyl Composition Tiles feature a sand-drift white finish to match many interiors. These tiles have through-colour construction for extended floor life and come with the Fast Start Factory finish for easy initial maintenance. Keep these durable vinyl tiles looking their best with damp mopping and polishing. The Merola Tile Cobble Hexagon White 10-1/2-inch x 12-inch x 13 mm Ceramic Mosaic Tile features a rustic handmade look in a classic hexagon shape. Its smooth, uniform glaze accents the variations in the size of each brick, emphasizing the individuality inherent in this piece. Easy to clean and mesh-mounted for easier installation, use this tile on an interior wall or a low-traffic residential floor. Ceramic vent cover made to match Lagos Beige tile. Size - 5-inch x 11-inch Finally a ceramic vent cover that matches your porcelain tile floor perfectly. 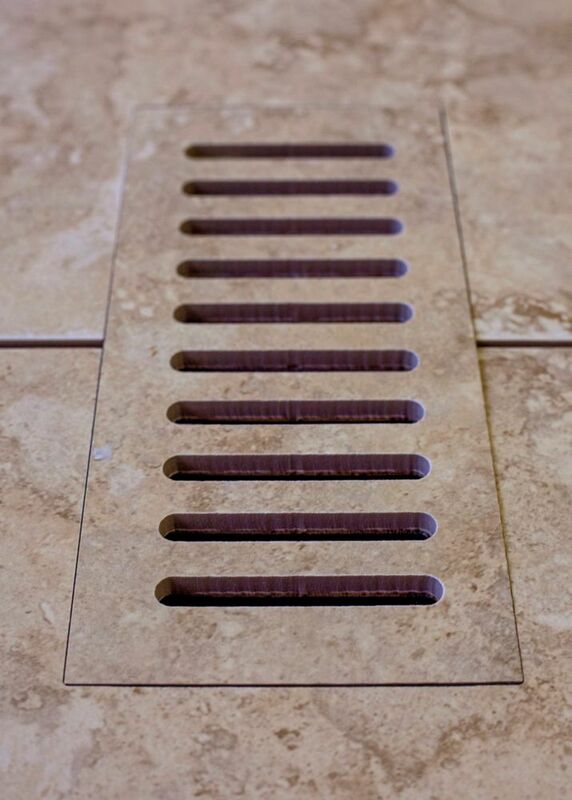 Our Flush Mounted floor vents add style to any tiling project. Each vent is made from the floor tile you've selected and designed to lay flush with your floor. Beautiful, durable and easy to install all of our Flush Mounted floor vents come complete with a sturdy steel back support and a separate diffuser (dampener) levelling plate which allows you to control the air that enters into a room. Adding porcelain or ceramic Flush Mounted vents to your new floor will give your room an elegant final touch.